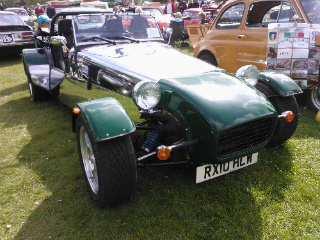 The Caterham Seven Superlight sports car range was launched in 1996 and featured construction using lightweight materials, and Rover K Series engines with ever increasing power. In 1997, the crossflow engines were replaced by Vauxhall 8 valve and 16 valve units until 2002. When the Cosworth BDR engine was no longer available, its replacement took the form of the Vauxhall 2 litre, 16 valve, twin cam unit, which produced 165 bhp. As soon as supplies of the Vauxhall engine ceased, Caterham reverted back to tuned versions of the Rover K Series units. In particular, the standard 1.8 litre K Series unit developed 122 bhp, whilst the highly tuned version developed 230 bhp. When the 230 bhp unit was added to a Superlight chassis which had been stripped down, it was capable of a 0-60 mph time of 3.4 secs, outshining the JPE Seven, since its lower output was offset by the fact that both the engine and chassis were lighter. 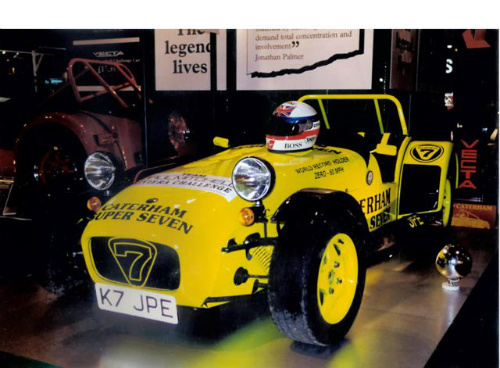 In 1999, Caterham created the Superlight R500, still with a 1.8 litre, K Series engine, but developing 230 bhp at 8600 rpm, and a 0-100 mph time of 8.2 secs. 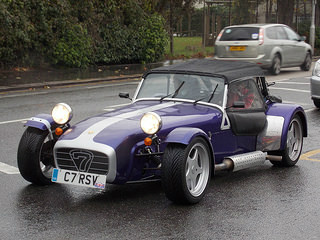 In 2000, Caterham created the option of the Series 5 (or SV), which had a wider chassis. That same year, an 1100 cc Honda motorcycle engine was fitted to a Superlight chassis to create the Caterham Blackbird, which produced 170 bhp at 10,750 rpm, a 0-60 mph time of 3.7 secs, and a top speed of 143 mph. This model produced performance on a par with the R500, and gained a Class win at the Nurburgring 24 hour race in 2000. 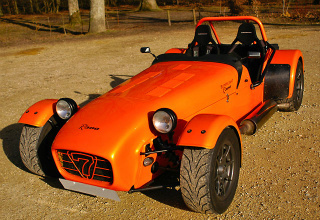 Since 2000, a Canadian company has marketed Caterham Sevens fitted with a 1300 cc Suzuki motorcycle engine, and producing a 0-60 mph time of under 3 secs. In 2002, Caterham entered a tuned, K Series R400 at Nurburgring, where it swept competition aside to win its Class resoundingly. In 2004, Caterham introduced the R500 Evolution, with a 2 litre, K Series engine developing 250 bhp, and which produced a new record for a standstill to 100 mph and back to standstill time of 10.7 secs. That same year saw the development of the CSR chassis, which featured a firmer spaceframe. By this time, Cosworth were supplying Caterham with tuned Ford Duratec engines, producing 200 bhp and 260 bhp. In fact, the 260 bhp engine had a maximum speed of 155 mph, with 0-60 mph in 3.1 secs. After the demise of Rover, Caterham replaced the K Series engines with Ford units, such as the Sigma engine for the Roadsports model, and the 2 litre and 2.3 litre Duratec units for the Superlight and CSR models. 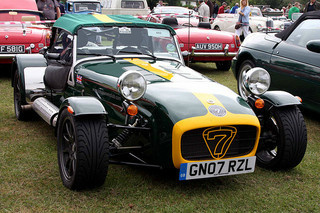 The entry level Caterham sports car was now designated the Roadsport, and was essentially the former Seven Classic model with either a Series 3 or SV chassis, and standard extras including a heater, hood, carpets, and a spare wheel. It offered a series of Ford Sigma engines, developing from 125 bhp to 175 bhp, with the suspension as per the Classic. The Superlight range fearured a wide track, six speed gearbox, lightweight front wings and dashboard, glass reinforced plastic aeroscreen and seats, and a detachable steering wheel. Lighter than the Roadsport, the R300 was powered by a 150 bhp, Ford Sigma engine, whilst the 210 bhp R400, and 263 bhp R500 models used a 2 litre Ford Cosworth Duratec unit. The factory built CSR range was powered by either a 200 bhp, 2 litre or 260 bhp, 2.3 litre Ford Cosworth Duratec engine. In 2006, the CSR260 Superlight sports car was powered by a 2.3 litre Ford Cosworth engine, with a 0-60 mph time of 3.1 secs, and a top speed of 155 mph. A 2010 Caterham Seven Superlight R300 in very good condition would fetch in the region of £29,000/$45,000, whilst a 1999 Caterham Seven Classic in good condition would command about £13,000/$20,000, and a Caterham Seven Roadsport 170 could be secured for around £17,000/$27,000.